Dr. Alexandra Roedder received her B.A. in Music from UC Berkeley, her Early Music degree from the Royal Conservatory of the Hague, and both her M.M. in Cello and Ph.D. in Musicology (on Japanese film music and globalization) from UCLA. She began cello at age 7 with Nina Flyer, and later studied with Irene Sharp, Leighton Fong, and Antonio Lysy on modern cello, and Elisabeth Reed, Elisabeth LeGuin, and Lucia Swarts on baroque cello. She learned to play the carillon at UC Berkeley’s campanile as well. She has taken masterclasses from Balasz Maté, Susan Lamb Cook, Anner Bylsma, Lynn Harrell, and Elizabeth Wallfisch, among others. 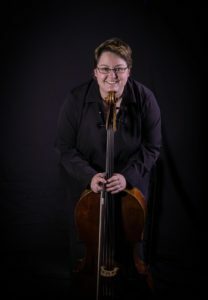 She is principal cellist of the Auburn and Folsom Lake Symphonies, and currently plays with Sacramento Baroque, the American River Chamber Players, InConcert Sierra, the Tonic/Dominant duo with pianist Nancy Lee Harper, and many, many, many others. In her free time she cares for three aging cats and one Roborovski hamster. She plays Minecraft on peaceful, enjoys historic swordplay with pixelated videogame enemies, and still geeks out over philosophical anime. Yes, she does speak Japanese.